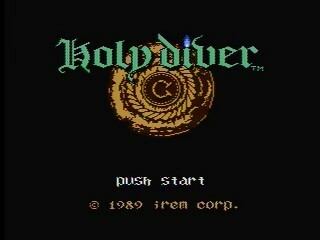 Released by Irem in 1989, Holy Diver is a Famicom exclusive with the best plot ever to grace a video game. You are Ronnie James Dio, and you must fight you way through legions of demons, dragons, and other assorted hell spawn with only an arsenal of magic spells to rescue your friend Zack Wylde and save the world from the clutches of the demons. No, really, thats the plot. Look it up. Best time: 0:18:45 by Josh 'Funkdoc' Ballard on 2013-03-05. This one has quite the backstory to it, both the game itself (see http://www.hardcoregaming101.net/holydiver/holydiver.htm for one of the best videogame plots ever and http://www28.atwiki.jp/holydiver/m/pages/16.html?guid=on for the oh-so-glorious enemy names!) and this run. While we were planning out the Kings of Poverty charity event in 2012, Min from Team Spooky requested that we add Holy Diver to the schedule; they had been playing it themselves and loved the game but could not get past stage 4, so they wanted to see what an experienced speedrunner could do. Since I was already running something like 12 games in that marathon, I asked Withhelde if she could do it and she accepted. Though she did her best, it turned out that trying to learn arguably the single hardest NES game a month before the event (not knowing any resources besides the TAS) wasn't the best idea, and the run there was mercy-killed at Stage 5. Not too long afterward, nasir_srk (who knew me through fighting games, got into speedrunning, and later moderated the AGDQ 2013 chat) sent me a 'special surprise' which turned out to be a Holy Diver cart! I already owned a Famicom thanks to the story I mentioned in my Wai Wai World comments, so of course I had to go for the record! Luckily, TRTerror (another regular in the same fighting-game IRC channel as myself and Nasir) had found a Japanese speedrun on Youtube that showed tons of damage boosts and other useful strategies we had no idea about during Kings of Poverty, so I was able to get this off the ground more quickly than I expected. I did world record attempts on and off in late 2012 and eventually obtained a 19:48 (almost a minute faster than the best Japanese time), but I still wasn't satisfied with that. The flood of charity marathons during that time (Spooktacular, #SMW, Sandython, then practice for AGDQ) halted any further progress, though I did stay sharp on this game since it was in every single one of those. I planned to finish this immediately after AGDQ, but the sudden Batman competition between myself and Dxtr put it on hold just a bit longer. About a week or so after I got the Batman WR back, I finally got the run you see here. Stage 1: Though the flying skulls are rough for new players, the game doesn't show its true self yet. Not much to say here besides general stuff, so I'll cover that. Your character fires normal shots when he's white and magic when he's blue, and you switch between those with Select; pressing Start takes you to the menu where you can select your magic. You gain a new spell for beating each boss up through stage 4's. The smaller item drops in this game (small heart & 2 MP) are random, but the much more important ones (full-health and full-magic potions) always come from the same enemies. The one spell you have on stage 1, Twin Fire, does more damage per hit than the normal shot and travels across the entire screen. The armband that I pick up early in this stage enables me to break blocks with my shots, so I can't clear the next room without it. Finally, the boss is one of the tougher ones to optimize for a speedrun, and this strategy is the closest thing to the TAS I have been able to pull off; jumping at the start of the boss room and the room with the spell is a glitch that prevents Randy from stopping earlier, but these are the only places where it's useful. Stage 3: Here is where many players tend to give up. The main problems here are the flying mutated fish and the Bouncing Bullet-Hell Chia Pet Scorpions, especially when they're together. My strategy for the first room with them is to fill the screen with enough sprites to despawn the first scorpion, then kill or damage boost through the second one; the firing patterns on the scorpions (and the bouncing robot heads in future stages) is completely random, so you have to wait a bit and react. The second room with the scorpions isn't as bad, although if you get unlucky you can despawn the heart container! As far as other stuff here, the new spell (Breaker) is much more damaging than your other options at this point. It deals especially ridiculous damage (hitting on every frame) if you connect with the ball it forms at the start. The boots enable you to jump higher a la Metroid and are mandatory to complete the game. This stage also introduces one other new item, the wings, which are the heart container equivalent for MP. As for the boss, hold left and A when you enter the room and you will get the jump needed for the instant kill on the first enemy – I told you point-blank Breaker was nuts! Stage 4: Just about everyone who survives stage 3 gives up here, as this is where the game goes off the deep end and truly becomes Holy Diver. The start alone is nasty if you don't know exactly where to use Breaker to get rid of the flying guys, the Chia Pet Scorpions are reincarnated as bouncing robot heads, and the pink golems are awful to deal with if you don't know about the damage boosts. I would say that this is the hardest stage in the game for speedrunning, and it may very well be the same when playing normally. Anyway, the new spell here is Overdrive, which creates two Gradius shields that rotate around you and do 1 hit every frame on whatever they touch. It's usually the best attack for crowd control and can be used in a couple places to break blocks beneath you. The one jump early in this stage where I damage boost through a mutated cat is nearly pixel perfect and will almost certainly get you killed if you miss it. Getting the full-health potion from the weird fire-snake enemy is annoying, as it is possible to make it appear too far away or even prevent it from appearing at all! Regarding the detour I take in this stage, the item I pick up (the staff) reduces the MP cost of all spells except Thunder by half; without it I would have to kill myself twice in the last stage to refill my magic, which would cost more time than this does. The golems have a very long invincibility period when hit and take 1 damage from everything, which is why normal shots are more effective than Breaker or Overdrive. Damage boosting past the golems in the last couple rooms here is somewhat luck-based due to their random firing patterns, and I have definitely reset quite a bit there. Finally, the boss here is especially awful, as the sprite limit means that you can sometimes get knocked into the pit by an invisible fireball. The boss has 3 separate sections that all shoot fireballs and must all be taken out, so Overdrive is by far the best attack for it. I only use Overdrive with no normal shots for the first part of the fight because the boss's firing is delayed when it gets hit, and Overdrive's rotation allows me to time certain jumps correctly to get a consistent strategy. I start using normal shots near the end because the boss is close to dead at that point and I just want to get it over with ASAP, but I lose a good bit of time trying to take out the last section here. Stage 5: This stage goes very well overall, given the amount of execution-heavy little things here. I do make one mistake in the room where I get the dragon for the first time (I meant to manipulate the enemy to run into my breaker shot and boost me into the dragon icon), but I get fantastic luck with the bouncing robot heads and the boss. So to start, this stage features the final new spell, Thunder. The bolt does the same damage as a long-range Breaker shot, while the explosion afterward deals 2 damage to everything on the screen. However, since it costs 20 MP and the explosion wastes time, Overdrive usually tends to be better in a speedrun for dealing with large groups. Since I get the dragon in this stage, one bit I forgot to mention is that you move forward a bit faster as the dragon than you do normally. Another interesting tidbit is that this stage has the only heart container I skip, as the room with that is rather far out of the way and health becomes much less of a factor in the last stage. This stage also features the first instance of a glitch jump that resurfaces later; if you move into a ledge from just below it, you'll clip yourself into it and be pushed on top when normally you can't jump up there. I do that twice in the room where I get the full-health potion from the bouncing robot head, to give you an idea. For the one long corridor with all the skelegoyles and robot heads and pits, I need a lot of sprites onscreen to despawn two shooting statues early on. The boss here is luck-heavy, as you want to whittle its health down with a few Thunders then have it fly at you so you can constantly hit it with Overdrive. It goes great here, but there are times when it can refuse to fly at you for over a minute (or fly and get itself permanently stuck in a wall, forcing you to reset!). Enjoy the fusion dance with Zakk Wylde on a cross and get ready for the final stage! Stage 6: Though the game doesn't tell you this, that fusion dance gives you one last special item, the cape, which doubles your defense. It's actually quite a nice gesture from the game and makes health a minor concern at most in this stage. So, the first concern here is the double damage boost. Getting through the start the way I do manipulates a bouncing red enemy to spawn in the right position for the boost to work, and you can't stand too close to the edge or too far away when hit. There is an upper route and a lower route for the first part of this stage, and the upper route is well over a minute faster; you're meant to reach it by destroying a high-HP shooting statue that drops a dragon icon, and even that is still faster than the lower route. The room right after the damage boost is one of the worst parts of the run, as you want to despawn a bunch of shooting statues but the game can randomly choose to despawn something else instead. Almost all of the jumps over golems are very tight and will likely get you killed if you miss any of them. The first room with spiders is a killer for new players, as getting rid of them just makes more spiders infinitely respawn right on top of you and combo you repeatedly – running underneath them as I do here is the way to go. The room where I use Blizzard is absolute hell without it, as flying skulls constantly spawn and knock you into pits. The room with the Satanic Beavis Heads wouldn't be so bad since they aren't that random, but the flying unripened raspberries are the single worst enemy in the entire game: random spawning, random flight patterns with pits everywhere, and completely invincible! You can easily die multiple times there through no fault of your own, so I was feeling relieved when I got through it. The last room before the boss is the toughest part of the game execution-wise, as the game requires you to do a nearly pixel-perfect jump immediately followed by one of those glitch jumps I was talking about earlier...all while skelegoyles, flying skulls, and a random invincible blueberry are all trying to knock you off! Blizzard and Overdrive are definite lifesavers here, and while this room could have gone better I'm not ashamed of this one. After all that BS, the final boss turns out to be an absolute joke with Thunder. I could have made it there with enough MP to cast one more Thunder, but the Breaker at the end does the same thing so I only lose a second or two to the menu. It's worth noting that the 5th and 6th bosses can both softlock the game if you finish them off with Thunder, but it happens less often than not and I'm not 100% clear on the causes. This run can be improved by somewhere between 15 and 20 seconds to my knowledge, but this game is far too random to optimize to even NES Batman levels (much less, say, Castlevania). This is only the second time I've ever gotten a no-death run and overall I am very pleased with this. Thanks go out to everyone involved with Kings of Poverty as well as Nasir for starting all of this, Vatchern & adelikat for their excellent TAS, amogiri for their Youtube speedrun that first taught us many of the core strategies (and TRTerror for linking us that run), Mike Uyama for finding a Japanese wiki with the previous WRs on it, Booty AKA Pasky for making a FCEUX hitbox viewer for this game, and Omnigamer for figuring out the Overdrive strategy used early in the stage 4 boss fight.